After suffering from an injury or illness, you want relief from the pain. Our physiotherapists regularly work with patients in a rehabilitative capacity. Caring and sensitive to your needs, our expertise will put you on the path to better health. 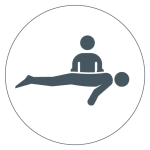 For those who have been injured and/or disabled in an accident or perhaps as a result of sports, our physiotherapists thoroughly evaluate your condition and then devise a specialised treatment plan that works for you. We have access to the best in biomechanical technology, including Real Time Ultrasound and muscle biofeedback training. And we don’t just stop with the treatment. Invested in your overall return to health and your future well-being, we will advise and educate you about how to prevent problems from returning or even from happening in the first place. 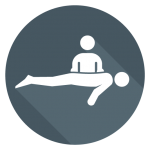 When you see a physiotherapist, they will complete an extensive assessment that may include your health history, evaluation of pain and movement patterns, strength, joint range of motion, reflexes and sensation. In addition, the physiotherapist will wish to review any relevant xrays or investigations that you may have had. Based on this assessment the physiotherapist will establish a diagnosis and will work in partnership with you to develop individualised goals and treatment programmes. This is used to promote patient confidence in exercise performance and can be used to facilitate strengthening or relaxation of muscles. This is important for rehabilitation and to prevent reoccurence of injuries. Real-time ultrasound is a non-invasive, painless procedure. It is useful for evaluating muscle activity in the back, abdominal region and pelvic floor. It is useful for both diagnosis/assessment and rehabilitation. Acupuncture can be used in combination with traditional physiotherapy to help in the management of pain, sleep, anxiety or musculoskeletal symptoms.